The sweetness of the squash and the saltiness of the goat’s cheese. This is a recipe from our great and dear friend Edgar. He is one of the biggest food lovers we know. He loves to cook and to eat. And we love that about him. His food is delicious, especially when he cooks with whatever he has on the fridge. Not so much when it takes 3 hours to get to the table (yes Edgar, this one is for you. Oh the stories…). 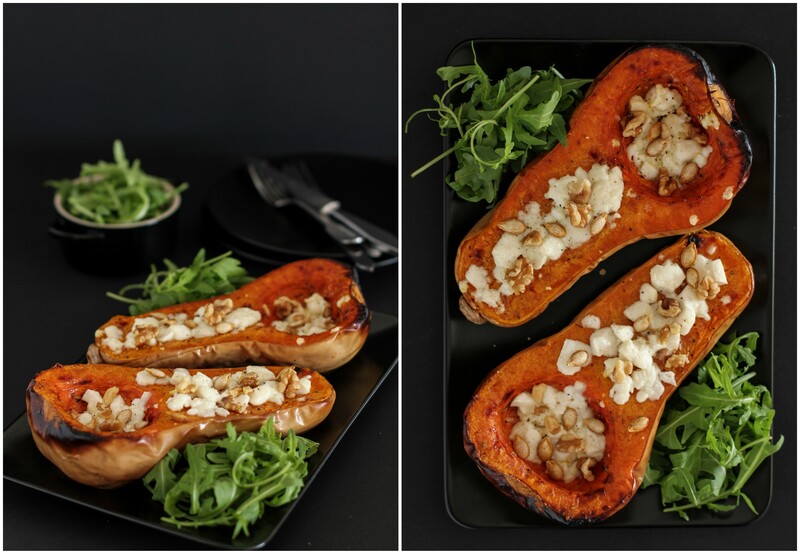 Have fun with Edgar’s Roasted Butternut & Goat’s Cheese recipe. He swears by it and we believe him. Wash the butternut and cut it in half lengthwise, remove the strings and reserve the seeds. In a bowl add the olive oil, herbs and a pinch of salt and pepper (remember the goat’s cheese is already salty). Mix it together until combined and spread it on both halves of the pumpkin. Place both halves on a baking tray and cook it for 45 minutes -1 hour. Meanwhile, clean the seeds and dry them. Place them on a baking tray over some baking sheet and cook them on the oven for about 10 minutes (some of them might pop like popcorns, so don’t be scared). Remove the tray from the oven and let it cool down. When the pumpkin is almost ready (you should be able to stick a fork or a knife through it) remove it from the oven and spread the goats cheese on both halves (if you notice some water on the squash cavities, remove the excess before spreading the cheese). Place it again in the oven for another 10 minutes until golden. Remove the tray from the oven and season the squash with a pinch of pepper, add the seeds and walnuts. Serve warm with some rocket salad. You should eat the skin as well, it’s delicious! Thank you so much Edgar. We are looking forward to try more of your amazing recipes.